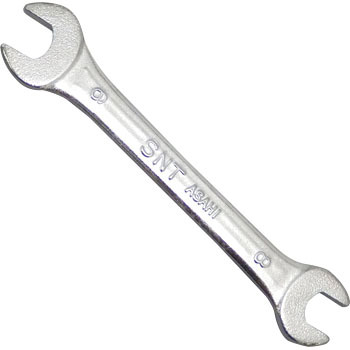 Of course the function as a spanner can be used without any problems. I liked the feeling that the surface treatment was not too bright and it was not too cloudy. This review is about item#2193563. The nut with no height was used unexpectedly, and I bought it along with the size of the top and bottom because I had a hard time. I think the quality is more than the price. This review is about item#2193554. I originally purchased it because I did not have a thin spanner. I tried to use it, but I found that it was a neat product without rattling. This review is about item#2193545. I used it for changing the casters of the chair. Because I was tightened very hard, I knocked at the end but could relax without spreading. This review is about item#2193572. It was used to tighten the nut in the narrow gap between the crank case and the cylinder. I managed to fasten the nut somehow, but I think I could work more easily if it was a little longer. I bought it because it is a necessary tool to remove a caster (front wheel) of a wheelchair, The thickness of 4 mm was just barely available and could not be used depending on the car model. Since the old rubber-tightened casters have become hard, The spanner side also needs some strength and it is difficult to choose a tool. Though it is thin, the strength is sufficient. It is useful for adjusting mirror and clutch wire. This review is about item#2193536. I purchased it because I needed a thin spanner. The amount is also cheap, and it can be used without problems. Maintenance of construction machinery, agricultural machinery, etc. If you are using a low nut such as an accelerator wire or a rod in double, you can not access it unless it is this item. Although it is written as if there is a problem in strength in the review of the other person, it is impossible to give out strength with this thickness even if there is tool steel used, I think that it is necessary to devise and use it. I can not repair with force. This review is about item#02193545. I bought it as a substitute for an inch tool. I think COSPA is a high product. It is handy because it can not be accessed because it is thick as it is a normal tool. This review is about item#02193554. Used for exchanging casters. Although it was c53c high carbon steel indication it lost to the bolt and the spanner was able to scratch the dent itself. I feel too much. Is it really C53C class? When we measure with calipers, is not it that the spanner's caliber 19 mm is too large (19.75 x 19.5 mm taper) to cut too much? It looks like a Chinese product that can not be put to practical use only by shape. This review is about item#02193572. This review is about item#02193536. It was as thin as expected. Work is easy. Use it for parts that are not wide and that do not fit in.